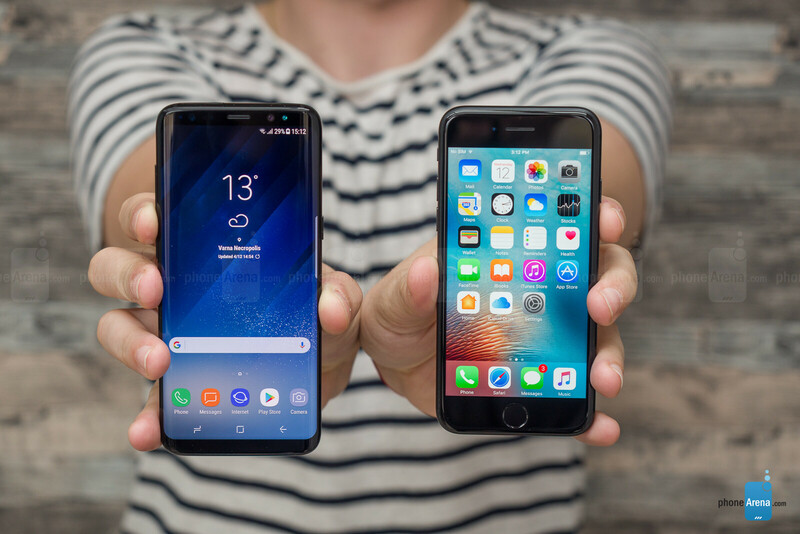 The Galaxy S8 is a looker, while the iPhone 7 scores more practical design points, and both are very easy on the palm. Samsung went thermonuclear on _phone_ bezels with the Galaxy S8, destroying its clicky home key and flat screen flagship options in the process. That is why the 5.8” S8 is half an inch taller, but as wide as the 4.7” iPhone 7, and thus comparable in holding comfort. 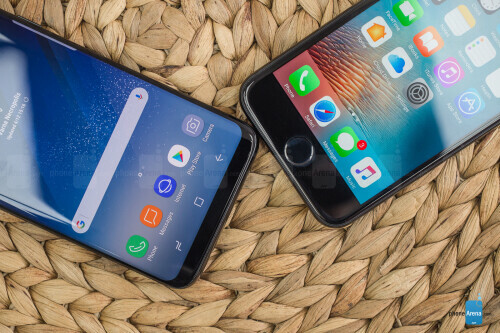 In fact, the size of these two munchkins makes them one of the most suitable for one-handed operation top-shelf phones on the market, and you can reach almost anywhere on their screens with your thumb only. That being said, you still have to readjust the elongated S8 slightly in your hand to, say, reach up and pull the notification shade. There is a catch with the Inch High Private Eye screen diagonal of the Galaxy S8, when compared with the iPhone 7, and it's called a new 18.5:9 screen aspect ratio. Due to the laws of geometry, the screen area is not nearly as large as it would be on a 5.8-incher with the standard 16:9 display format. It is definitely bigger than the iPhone 7's, though, so you can, say, fit more text on one screen when reading, but is a double-edged sword when displaying 16:9 games and vids. These are the vast majority of titles for the moment, and either get letterboxed, or stretched out of proportion. Having black bars on the sides isn't a huge deal, but can be annoying. 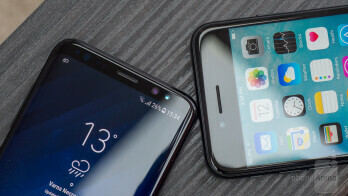 Gorilla Glass 5 meets metal in the chassis materials of the S8 and the iPhone – one is more shimmery but prone to cracking when dropped, while the other is less pretentious but stands better to everyday abuse. If the Galaxy slips out of your hand and falls flat on its back, there is a greater chance for ugly damage than with the iPhone, whоse aluminum alloy would simply get a bruise or two, for instance, and that has been visualized in a few drop tests already. The virtual home key of the S8 now provides pressure-sensitive area to ease the transition from a physical one. Its feedback is similar to the Touch ID home button of the iPhone. A physical feedback when tapping a home key is not really necessary, though, as most Androids with on-screen keys have already demonstrated, so we'd file the pressure-sensing screen section of the S8 in the “thanks for playing” cabinet. The physical keys around the sides of the handsets are all sturdy, easy to feel and press without looking, and with good tactile feedback. Apple has its staple mute switch there as an extra, while Samsung outfitted the S8 with a dedicated key to launch its new Bixby virtual assistant. To achieve the new 2:1 “Univisium” aspect ratio trend, or thereabouts, Samsung outfitted the S8 with a curved “WQHD+” display. It's a 5.8 inch panel across when flat, and has 2960 x 1440 pixels of resolution, hence the plus sign. The S8 has adjustable display resolution, and comes with 1080p set as default, though you can always move the slider all the way to the right in the display settings, and get to the screen's full-res potential if you need it for VR or something. 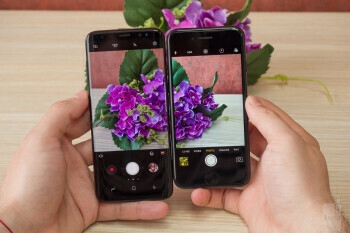 The iPhone 7 has a 4.7” flat panel of the IPS-LCD variety, which offers good viewing angles, and credible sRGB color presentation, but is also “wide color” (DCI-P3 gamut) capable, so photos taken with the iPhone's camera which shoots in P3 as well, can be viewed in full bloom. 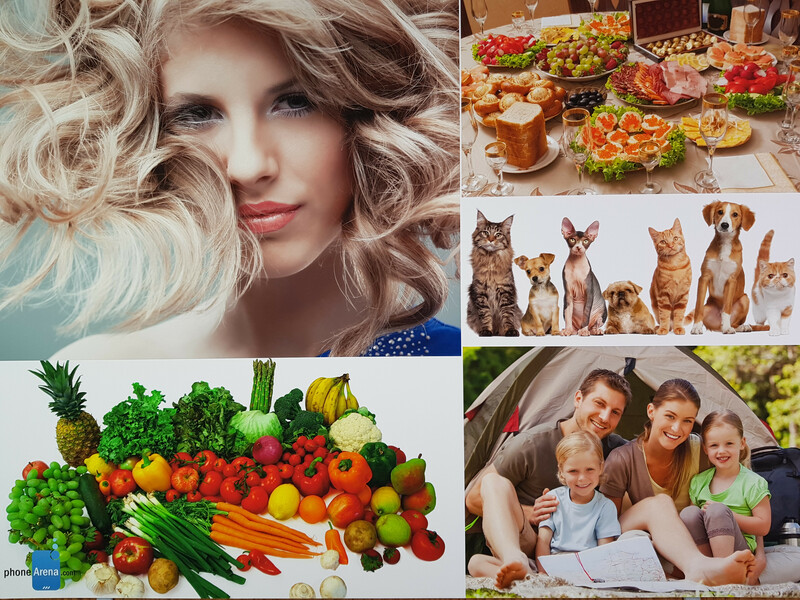 As for image quality, the S8+ display is the typical AMOLED affair in the default Adaptive mode, with gaudy colors that extend way beyond the standard sRGB gamut, and whites that turn blueish with the slightest tilt of the phone. Even if you set the display in the most color-credible Basic mode (sRGB), you'd still notice very pronounced colder tinting when you look at it from even the slightest angle. The iPhone 7's screen, on the other hand, exhibits more natural colors, and color temperature doesn't shift drastically at an angle. The S8 display is “Mobile HDR Premium” certified, so in Cinema mode you can be watching those new UHD movies shot in the P3 gamut as their creators intended. The catch, though, is that you have to preload HDR content, as neither Netflix, nor Amazon Video have the Galaxy S8+ as a compatible device for their wide-color streams. We checked with Netflix, and the rep said that they plan to include mobile compatibility in the future, but for now the S8 display certification would be of limited practical use. 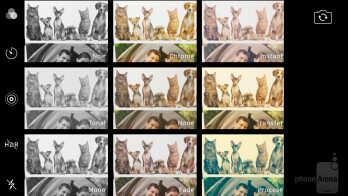 In order to hit the HDR10 standard, however, Samsung pumped up the peak brightness abilities of the AMOLED panel, which, coupled with the low screen reflectance, bodes well for sunlight visibility in autobrightness mode, and that's an arguably more useful development stemming out of the HDR certification. The iPhone 7's panel is also very bright, at 600+ nits, so it offers great outdoor visibility as well. 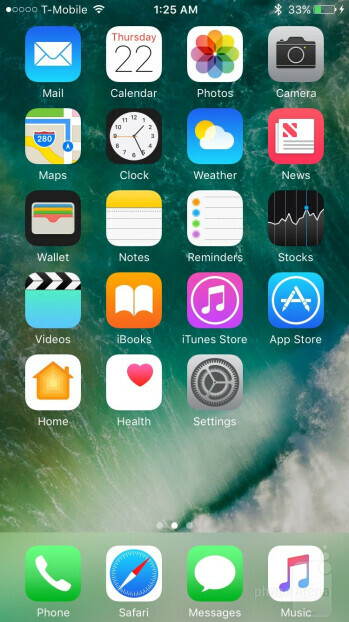 Both the iPhone 7's iOS 10 interface, and Samsung's UX are painfully familiar from our reviews, so we'd focus on added functionality. The S8 does come with new iconography compared to, say, the S7 with the Nougat update – more uniform and minimalistic – but that beauty is skin-deep, as the settings and other menus are nearly identical. 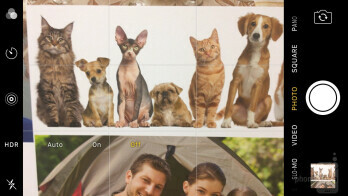 Not that they look bad. Samsung has provided some handy new gestures, though. 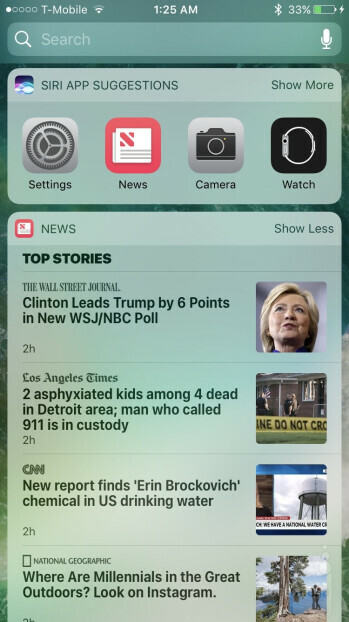 You can, for example, slide up from the bottom of the screen to pull the app drawer now, then swipe in either direction to close it, or swipe on the finger scanner to bring down the notification shade. 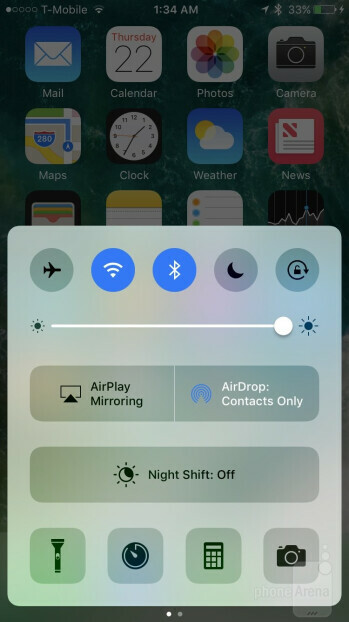 On the iPhone 7, the connectivity switches and other oft-used controls are placed in the Command Center at the bottom, and it is much easier for your thumb to swipe or tap at the bottom than try to stretch all the way up. Samsung's interface overlay on top of Android 7.0 Nougat is, as usual, full to the brim with functions you may or may not use, like the iris recognition security that is in addition to the fingerprint and other authentication methods already on the phone. It may be cool for bragging purposes, or if you are in a secure corporate environment, but not that much faster or more convenient than finger scanning or keying in a PIN number. 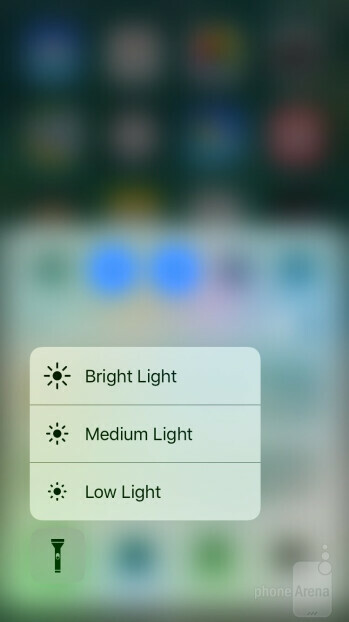 Not that Apple hasn't added features that haven't proved everyday necessities just yet (looking at you, 3D Touch screen Peek and Pop), but on Samsung's new Experience UX, just as with TouchWiz of yesteryear, these are much more numerous, and often redundant. 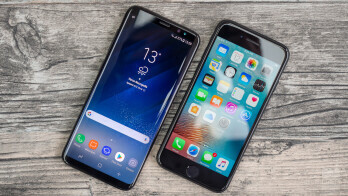 The end result for Samsung handsets is that you get a more function-rich, but a tad slower to move and execute apps interface, compared to iOS. Some of these extra options, especially with Nougat, can be attributed to Android itself, like the split-screen multitasking, or the power management features, so Samsung doesn't really have a say here, but others are of its own making. The new Bixby virtual butler, for instance, claims it will be better than Apple's Siri in terms of natural speech recognition and language support, but its full functionality will be coming at a later date, and for now it just duplicates Google Assistant. The Galaxy S8 is powered by the latest and greatest Snapdragon 835 (US and China), or Exynos 8895 processors, which blaze through benchmarks, and even encroach on Apple's scores achievable with the A10 chipset in the iPhone 7. Moreover, 4 GB of RAM are a pretty generous amount still, but, as we mentioned, the Samsung UX is heavier than iOS, and not as organically fused with the underlying operating system kernel, so this raw horse power doesn't translate into unequivocally better performance of the S8+ compared to the 7 Plus, and even falls behind in some demanding graphics tasks. Samsung starts at 64 GB of internal storage this year, and provides a microSD slot for memory expansion, while Apple has 32-256 GB tiers to choose from. 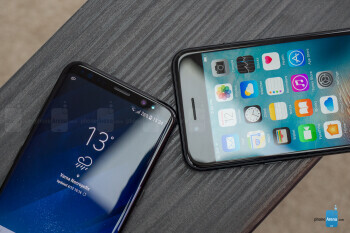 These two are the handsets with the most LTE bands you can find (20+ on both), so if you are a globetrotter they are your best bets for local network compatibility. The S8, however, has the upper hand in theoretical LTE speeds as it is the first phone to support Cat. 16 for up to 1Gbps downloads, if you carrier can provide those. T-Mobile already boasted that it can, in certain areas and conditions, so there's that – you can eat through your 30 GB “deprioritization” limit in no time now with the Un-carrier's unlimited plan. 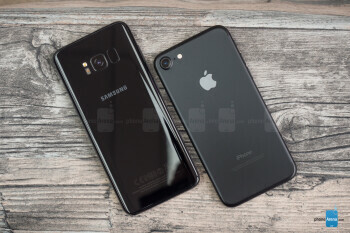 The Galaxy S8 and iPhone 7 are chock full with almost every radio you can think of, and Samsung even throws in its MST standard for wireless payment authorizations that can mimic a swipe credit or debit card. 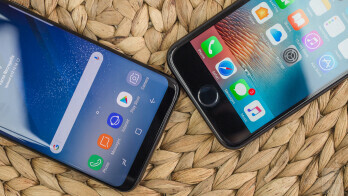 As for wired connectivity, Samsung moved to USB-C at long last, while Apple has been doing Lightning for a good while – both are the best in speed and power transfers, so no complaints. Samsung gave the S8 the same camera that is in the S7 edge, at least on paper – a 12 MP shooter with Dual Pixel focusing tech. The camera system uses new Sony or Samsung sensor models, though, and, in addition, the selfie snapper has been upgraded to an 8 MP autofocus affair, from a 5 MP fixed-focus unit. The iPhone 7 also has a 12 MP rear camera, but with a smaller sensor and pixels, which, all other things being equal, would mean less photons soaked in for low-light scenarios. 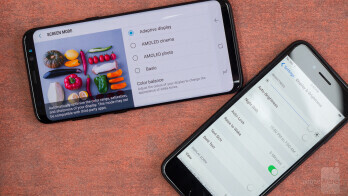 Samsung cleaned up its camera app interface significantly, with only the most used functions on the main screen, like with the iPhone, while the numerous shooting modes and color effects are tucked a gesture flick away. The front camera interface got richer, though, as it can now add bunny ears or funny sunglass stickers to your pics and vids, Snapchat and Apple Clips-style. 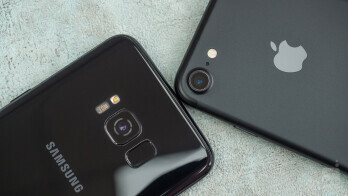 When it comes to speed of shooting, these two are kings of the hill, and yet the Galaxy S8 feels slightly ahead, as the Dual Pixel tech is best in class when it comes to focus and refocusing times. The iPhone captures images in “wide color,” and these can be viewed as such on the handset's display immediately, which is pretty svelte, especially if you are swapping photos with other iPhone 7/7 Plus users. Oftentimes, especially in sunlight scenarios, the pictures from the iPhone 7 come with a warmer color temperature than those from the S8, but sometimes the roles are reversed, and it's the S8 that gets warm and fuzzy. Still, it's the pictures from the iPhone 7 that come out much warmer than natural, to the point of having a yellow overcast, of which we aren't particularly big fans. In those scenarios, the Galaxy S8's photos tend to look more authentic, though not perfect either, due to an oversharpening and saturation which makes pictures stand out at first, but also gives them a somewhat artificial look. Both phones can capture copious amounts of detail, and handle tricky dynamic range scenes in a superb manner – probably the best that the tiny phone sensor technology can offer at the moment. Needless to say, the fast processing times and auto HDR modes play a significant part in these stellar exposure adjustments that the iPhone 7 Plus and S8 are capable of. In low-light the Galaxy exhibits some sharpness and exposure advantages, emphasizing the shadows a bit more. All 4K video abilities aren't created equal, and Apple, while a late bloomer, used to do UHD recording the best of them all, with smooth footage, devoid of artifacts, and no recording limitations. With the Galaxy S8, however, it now has a worthy competitor, as Samsung hits all the spots mentioned, too, but the Dual Pixel focusing system that uses the whole sensor to focus, makes going from near to far objects, and vice versa, a seamless process. Not that the continuous autofocus of the 7 Plus is slow, it's just not as fluid. Both the iPhone and the S8 are capable of slow-motion video with 240fps at HD definition, which can create some very eye-pleasing effects. The AMOLED display of the S8, while superior in terms of contrast and with HDR certification should the need arise, is a bit of an oddball on the S8. Not only is video watching marred by the slightly curved display sides, but also the new aspect ratio is hit or miss. Go to the YouTube app, for instance, and you will find yourself with black bands on the sides of the screen to fit the standard 16:9 aspect, or with slightly cropped footage in compatibility mode. Even if you are streaming one of the new Netflix series, which are now shot in 2:1 Univisium format, they'd still show letterboxed, even if you download them for offline viewing, and there is no compatibility button in the Netflix app by default. You have to explicitly go to the Full Screen option in the Display settings menu to add an aspect ratio compatibility option for the Netflix app. Upon tapping said button, if the series is 2:1, then you lose nothing by making it stretch and fit the whole display, but if it's 16:9, tough luck, you got cropped. The Galaxy S8 outputs decent audio with its sole speaker, but the iPhone 7's stereo sound does it one better. Even though it is smaller than the 7 Plus, so the stereo effect is more dubious, there's a fuller, stronger sound coming out, while the S8 tonality and strength range are more limited in comparison. 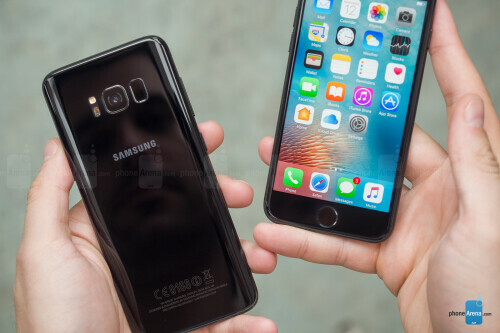 The Galaxy S8 produces loud and clear sounding voices emanating from the earpiece, yet the iPhone 7 outshines it, as its earpiece, that doubles as a stereo speaker, outputs an even stronger, fuller sound. The noise-canceling mics on both phones do their jobs well, relaying our voice with enough strength and clarity to the other end of the line. 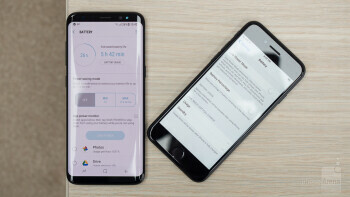 At 3000 mAh, the Galaxy S8 has a much larger battery than the 1960 mAh pack of the iPhone 7, but the high-res display affects battery life negatively, so it clocked a similar endurance during our grueling battery benchmark – 7 hours and 30 minutes for the Snapdragon version, against 7 hours and 46 minuted for the iPhone, while the Exynos S8 managed nearly an hour more. Still, about eight hours and a good standby drain thanks to Nougat's enhanced Doze mode mean that the S8 will get you through the day. A weekend away from the charger, however, will be problematic with both phones. Where the S8 excels is charging speed, as it takes about an hour and 40 minutes to top it up, while the iPhone needs 2 hours and 20 minutes. Wireless charging is also available on the S8, and it is the fastest of its kind, taking two hours from zero to a full charge with Samsung's official charging stands. 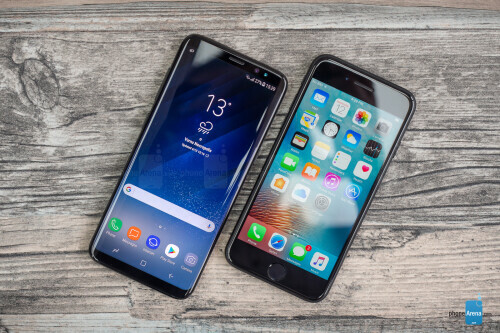 Diametrically opposed in terms of design, the glass-y curved Galaxy S8, and the light metal iPhone 7, are still two of the most palm- and pocket-friendly flagships you can get this season. The S8 offers more screen real estate, but rescales or letterboxes apps and videos made with 16:9 ratio in mind. Still, the larger, higher resolution display of the Galaxy S8 that fits in a slightly taller than the iPhone 7 footprint is an important advantage. 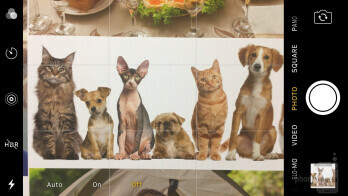 So is its fast-focus camera with superior low-light abilities. The iPhone 7, on the other hand, takes it to task with wide color image capturing, stereo speakers, and faster, more streamlined interface, with a richer apps and services ecosystem. 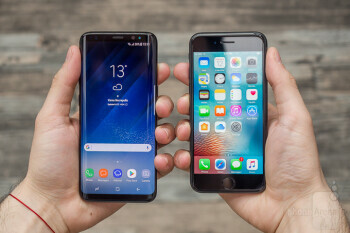 Given the comparable pricing, those looking to buy a new phone may indeed be swayed by the snazzy and unique design of the Galaxy S8, at least until the next iPhone edition lands, provided that they aren't deeply invested in Apple's app and entertainment services already.